Present time - Mikro Trading a.s. Since March 2011 we have been in our new logistic and administrative premises with the ideal traffic accessibility (D2 – exit 41). The strong warehousing background and modern logistics enable our fast reactions to demand and orders, including dispatch, even though we handle more than four million pieces of toys a year. A ghost is not only a symbol of Mikro Trading a.s. company but also a mark of the guaranteed quality and safety of the toys brought to the market by our company. Toys with a ghost mark guarantee a lot of entertainment and enable the development of creativity and imagination. The team work spirit is present in the whole company. The creed of our almost fifty employees is satisfaction of all our clients which also include store chains, both domestic and international ones (Kaufland, Globus, Albert, Coop Centrum, Coop Morava, Prior and Penny Market), some of which even use our offers in the area of consumer event preparation. 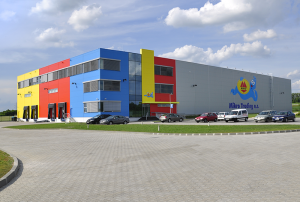 An important part of our businesses are our direct customers buying for their own shops and many cooperating wholesales, not only in the Czech Republic but also a wide range of clients from the other member states of the European Union.